First release of Accademia del Ricercare with classical label CPO in a long-term partnership. They presenting Spirited Dances from the Seventeenth Century. Accademia del Ricercare, an ensemble that has logged more than eight hundred concerts over the past twenty years in changing formations geared to the particular repertoire, offers a fascinating overview of the German instrumental world just prior to the outbreak of the Thirty Years’ War (1618-48). 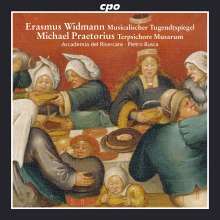 Michael Praetorius, one of the most prominent musicians of those times, is represented here with a suite, while we also have the opportunity to become acquainted with a virtual unknown in the person of the composer Erasmus Widmann, whose works recorded here demonstrate that a myriad of talents once existed side by side with more familiar musicians and now merit their rightful places in music history. You can look forward to dances of spirited motion quite literally inviting the listener to dance and exhibiting a full and richly varied sound palette.